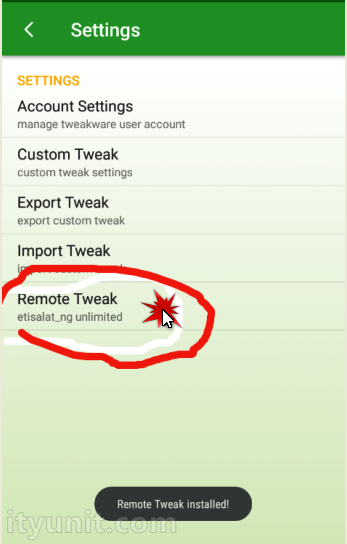 Tweakware V5.8 VPN brings free unlimited browsing on the Etisalat network. Now equipped with a super plug-in settings called Remote Tweak that exploit a loophole on the Etisalat Network and provide unlimited downloads. Free browsing on Etisalat has previously been limited to 60 mb per day but with this new Remote Tweak pluggin, you can get unlimited download and browsing even on free servers. 2. Install and run the app. 3. Go to 'SETTINGS' and click on 'REMOTE TWEAK' to start the installation process, it is about 1MB. 4. If you don’t have data to install the “REMOTE TWEAK” from inside the app, Click here to download the backup copy of REMOTE TWEAK and keep it safe because every time you exit the app, you will need to import and install it again for it to work. 5. After installation is finished, go back to the home screen and select the 'REMOTE TWEAK' option. 6. Click on CONNECT to start connecting Tweakware and wait for it to get connected. The Remote Tweak is configured not to be permanent save on your Tweakware VPN app, so when you Force stop, exit or Reboot your phone, you will have to download the Remote Tweak again. 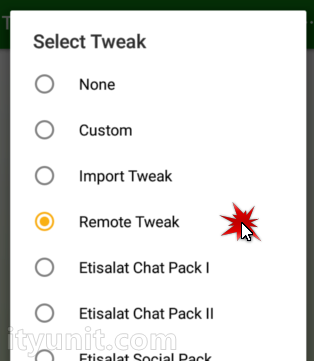 Just go to Settings and click on “Import” to upload the Etisalat Remote Tweak to the Tweakware VPN app. If You Get Error Of "remote Tweak Installation Failed" and you are sure that you have data on your device, it could be that the Remote Tweak Server is Down. You Can Try Again Later Or After A Few Hours. Possibly, you have exhausted the daily 350MB allocated on each of the free servers, just disconnect and choose another of the 15 servers and continue browsing. Alternatively, you can sign up for premium account for a cost of N500 and browse unlimitedly uninterrupted. Nice and will explained. Even Stark VPN Now bypass etisalat 60mb daily usage. Can one use it with etisalat 0.0k or must have mb?